We are a leading entity, engaged in providing a wide series of Refrigerated Container. Furthermore, our clients can avail these products from us at low prices. 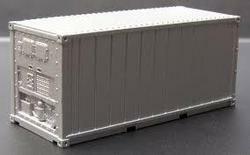 40 Reefers Container for sale @ Nhava Sheva. We manufacture Prefabricated Cold Storage Rooms using cutting edge technology, latest industrial equipment under the supervision of skilled engineers, making them the most preferred range of cold storage in the market. Our expertise in cold storage area units has enabled us to stay ahead of our competitors by a big margin. We put forth a wide assortment of refrigerated containers in Navi Mumbai to our clients. In order to keep the stored item in hygienic condition, it is provided with premium quality is 304 food grade SS sheets. These containers are widely used to move items such as meat, fish and ice cream. Apart from this, these items remain chilled upto the temperature of –24o c.
Container 40feet with refrigeration in goog condition. The ability to store chilled and frozen or a range of temperatures in the same cold store. Various models available with alternative ratio space per temperature. 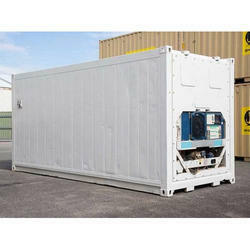 Refrigerated containers are essentially insulated dry vans containing built-in refrigeration units. These containers keep perishable goods cold or frozen and are designed to operate at temperatures between 80°F and -18°F (27 °C and -28°C).